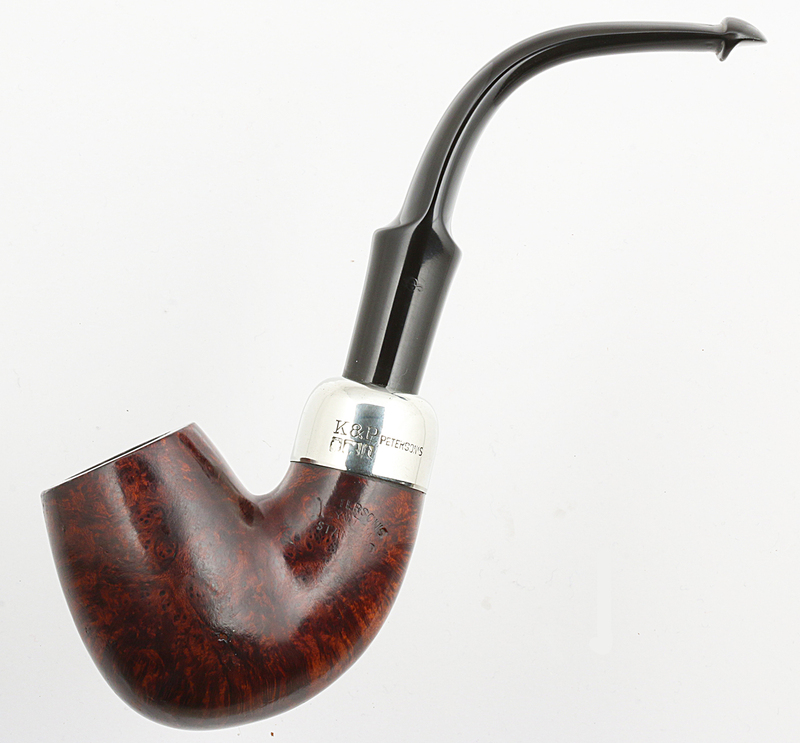 I like to tell myself I’m not much of a pipe collector, but work on the Peterson book has forced me into the role more than I’d thought possible, all “for the greater good,” my Pipe Acquisition Disorder tells me. That being the case, during the course of writing and research on the Peterson book a number of interesting pipes have come my way. 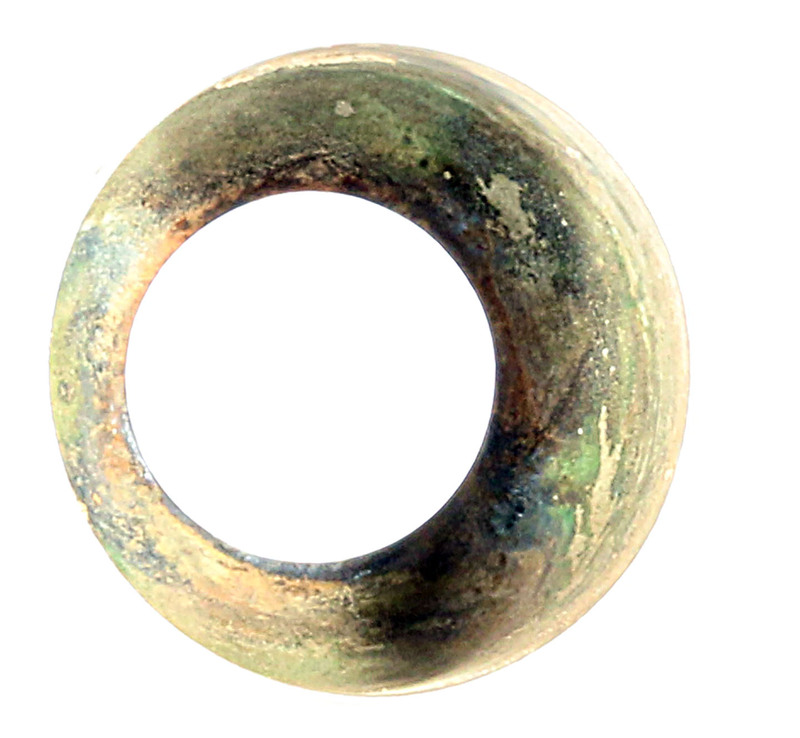 This MADE IN EIRE (in a circle) 312 Standard System is one of them. 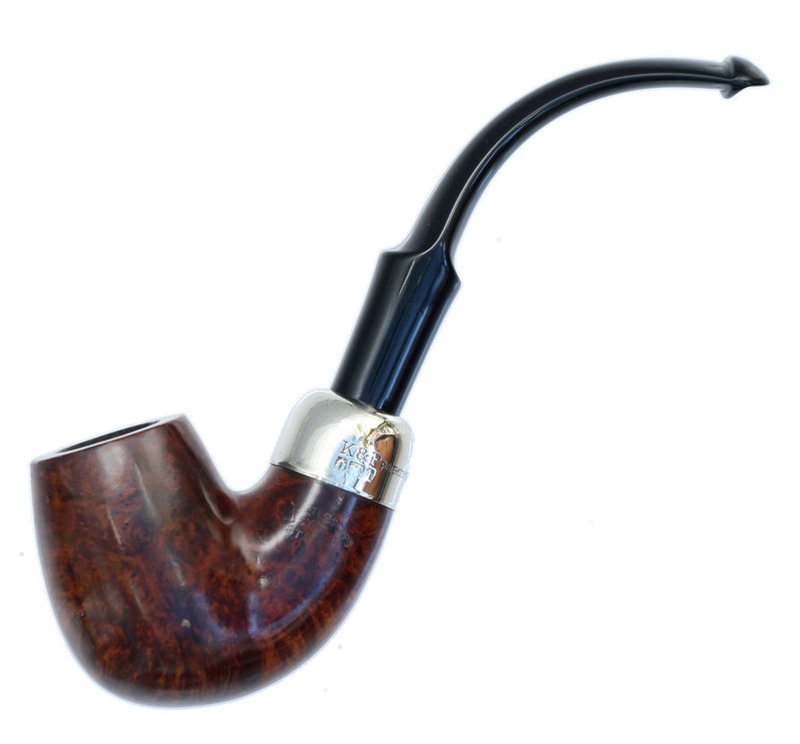 There are so many “wrong” things about this pipe that I thought you might find its story interesting. When it arrived a few years back, at the beginning of our labors on the book, I was delighted because it was the first EIRE stamp I’d ever seen first-hand—EIRE being that very, very short period of Peterson history from 1938 – 1948. But to my taste, it smoked sourly and so I rarely pick it up. And for me that’s the first wrong thing—a pipe that gathers dust in the rack needs to find a home where someone is smoking it, or at least giving it some serious appreciation. 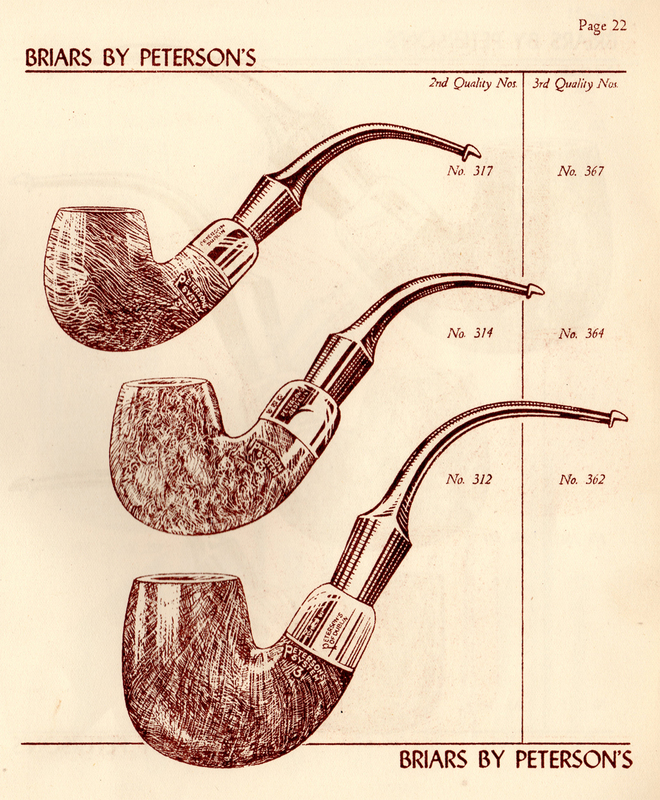 I had restored the pipe to the best of my ability back when I received it, but in beginning to think about letting it go, I decided I’d have a second try at freshening it up, not wanting to sell someone second-rate goods. So I gave it a 24-hr. dunk in an isopropyl bath, and it popped out smelling clean and sweet. That bit of wrongness, at least, was taken care of, as I proved to myself when I gave it a trial smoke at the end of the reconditioning. After the alcohol soak, inasmuch as the wood is at the very least 70 years old, I thought I’d treat it to a coat of mineral oil, as Charles Lemon has demonstrated on his blog. I don’t think Charles leaves this on for more than 15-20 minutes, and certainly not all night, which I did. This wasn’t a mistake, exactly, but I don’t recommend it, for reasons I’ll explain later. Anyway, the mineral oil did rejuvenate the wood and break out the grain, but it also re-darkened it and gave it a matte finish. The black walnut stain is another “wrong” thing, albeit from a purely subjective standpoint, as it is unusual among the Peterson Systems I’ve seen. 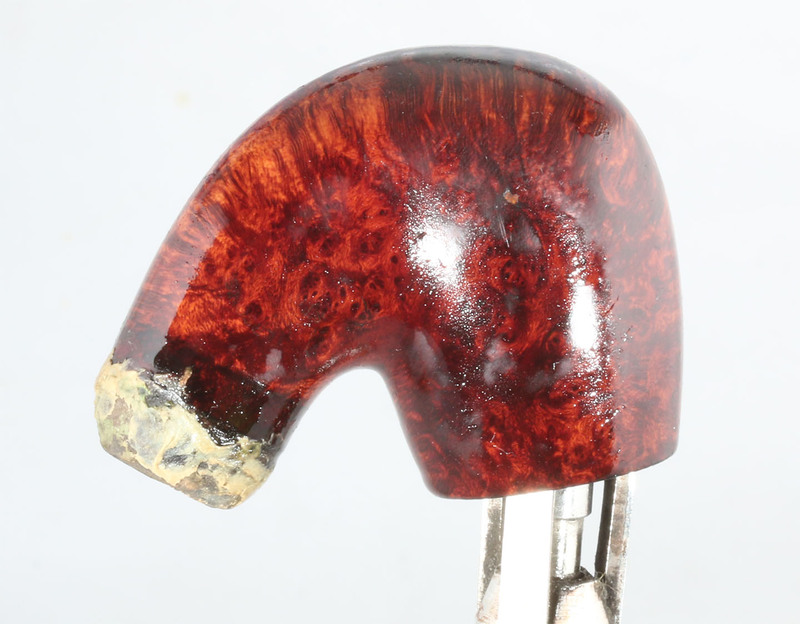 At first it was off-putting, as it obscured so much of the grain, and I’d hoped after the alcohol soak and clean-up I might be able to lighten the pipe a little which would make it more pleasing to me. You can see that it’s not a bad piece of briar: some small minor fills, great birds eye on reverse side, but there is a major bald spot on the reverse above the stamp on the bowl (which I failed to photograph, but you get the picture). And that, I suspect, in combination with the 3 or 4 little fills, is what made it a Standard System, and what made giving it a black walnut stain the right thing to do. Here’s the third bit of “wrongness.” The alcohol soak, as it often does, loosened the ferrule and so I took it off to have a look under the hood, so to speak. And take a look at it. It’s not nickel-soldered, it’s pressed! There’s no solder line on the outside or inside of the cup. “Wrong” is the incorrect word, of course. Surprising is more apt. 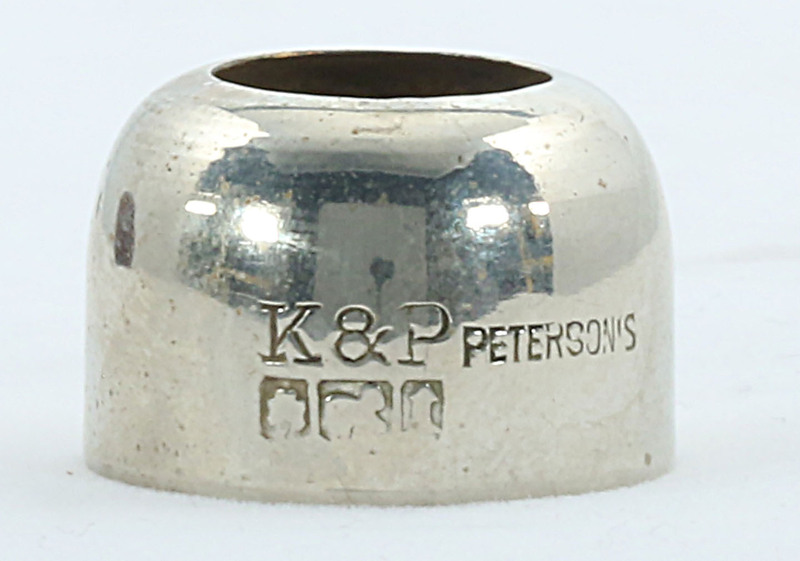 You see, we know from the K&P Employee Register that K&P employed nickel-solderers for decades. And we (that’s my co-author Gary Malmberg and myself) had been thinking all along that all nickel mounts were hand-soldered in the factory before about 1961. I went scurrying over to my rotation and pulled off the pre-1961 Standard Systems, and sure enough, some have that tell-tale solder-mark on the outside, others don’t. What’s the answer? I don’t know, but I do know the later pressed ferrules lacked the faux hallmarks (shamrock, wolf hound, round tower), and this one has them (although they’ve been almost eradicated by buffing), indicating that it was made prior to 1961, when the faux-marks were discontinued. A fourth “wrong” that bothered me about this pipe: it’s a 312 Standard System, quite plainly marked, and the MADE IN EIRE stamp is supposed to mean it was made while Ireland officially knew itself as “Eire.” But during those years, a 312 was a second-grade pipe, not a third, and would have had a sterling mount, right? 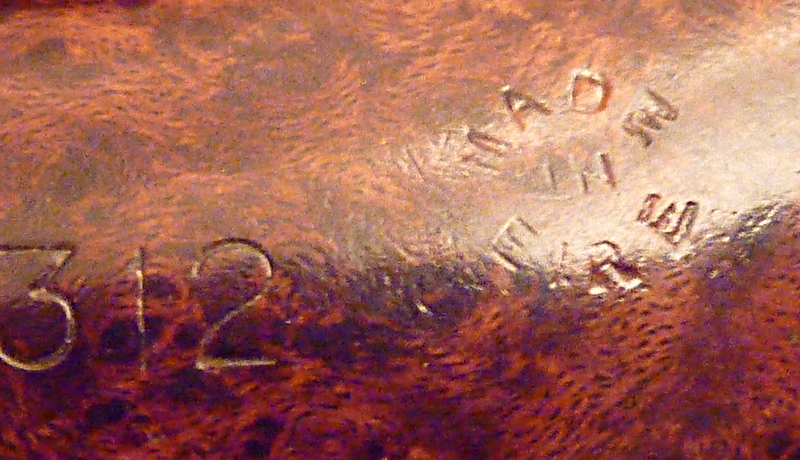 The shape number for a third grade (with nickel mount) was 362 in the 1937 catalog. In addition, it should have had a “3” stamped under PETERSON’S over SYSTEM on the obverse of the bowl, instead of STANDARD. A fifth, minor “wrong,” and one easily corrected, was simply that the mouthpiece looks like a replacement. The arch bend (which became more-or-less standard by the late 1980s) just didn’t ring true to the Eire era. After a few attempts with the heat gun and some dips in a bowl of cold water, I gave it a bend more typical of its era, seen in the 1937 catalog. I followed the stem restoration with some final touches to the bowl, giving it a few coats of carnuba. Now, remember a moment ago when I talked about the mineral oil? 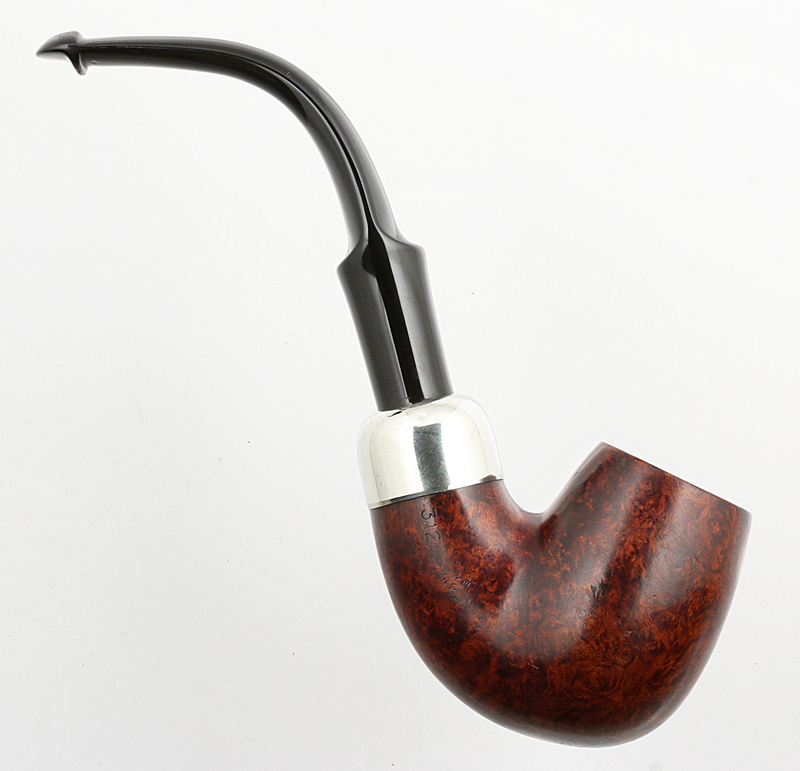 When I smoked the pipe to check the bowl for sweetness, the oil pressed outward–I could see it visibly evaporate–necessitating a fresh coat of carnuba. I smoked it a second time just to be sure the mineral oil had dried, and it had. Finally, of course, a pipe is simply “wrong” for the pipeman if he doesn’t appreciate it, which in my way of understanding (which is not everyone’s) means smoking it. I did smoke it twice to assure myself it was sweet and clean, but after such a problematic relationship, and with other established 312s in the rack, I knew I’d never give it the attention it deserves: respect but not companionship, I suppose. So I gave it a final touch-up, cleaning out the mouthpiece again and giving the bowl a light cotton-pad and isopropyl treatment before putting it on the market. And as of this writing, I’m happy to report it has found a new home in Waco, Texas, where I understand it is being treated with the admiration it so richly deserves. *FRAZING MACHINE: A machine which guides briar block against cutters to duplicate preselected pipe shape. A clamp-fitted shaft and a cam follows a master model to shape shank and lower half of bowl. 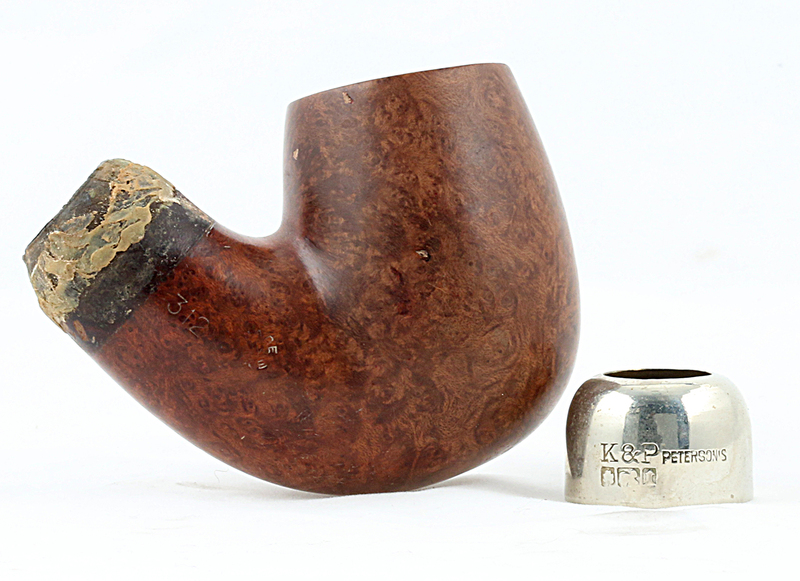 I’ve had a few pipes saved with a last-ditch isopropyl dunk. Nice bend job on the stem! 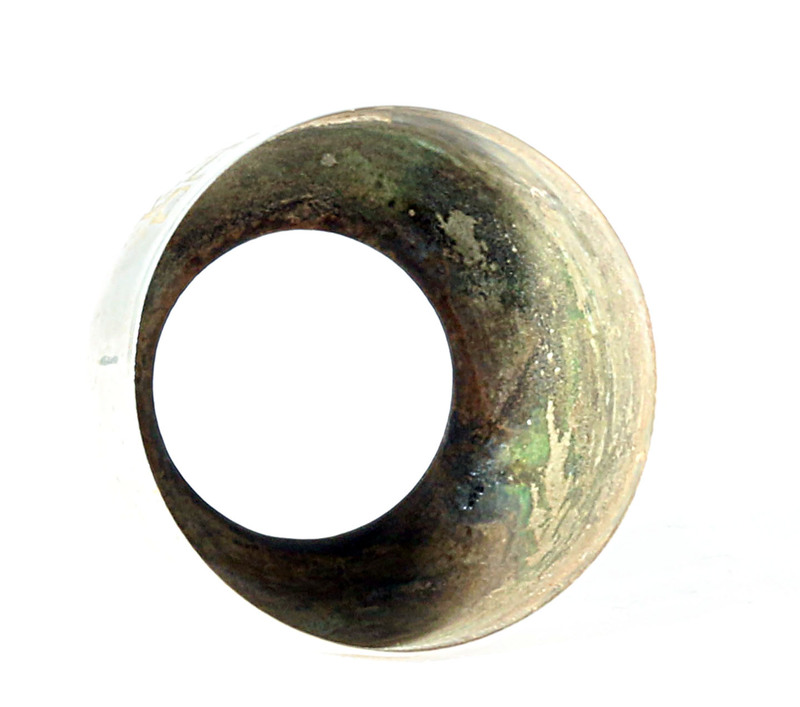 It is surprising what an old pipe can teach you, if you look close enough! This morning I started on a De Luxe 120 bought in Dublin in the 90ties. Two of my favorite Pete shapes, Jorgen! Mark has given us a good read on this one. Thought I would share it with the readers on rebornpipes. Thanks Mark. Thanks, Steve! You’re “the Man” in my book. Wow, I’d love a closer look at that machine, I’ve never seen one before. Another entertaining and informative read, Mark. And you are bang on with the mineral oil. I apply it lightly with a cotton pad and let it sit for 15 minutes or so before removing the excess with a towel. The pipe turned out very nicely. Glad to know it’s being used and appreciated! Mark, thanks for the highly informative post. You did great work on this pipe and I’m very happy to have gotten it. I’m actually in Austin, but rest assured she has gotten a good home ! Austin! Sorry for that. Glad you like the pipe. It’s a fantastic piece. Next Post81. Restoring a Peterson-Sillem’s Ebony Spigot.